Fido's Emu Oil Shampoo is a luxurious, soap free shampoo containing Australian Emu Oil. Emu Oil adds gloss and shine to the coat as well as soothing the skin. 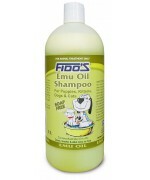 Fido's Emu Oil Shampoo is ideal for all coats and skin types. Particularly suitable for use with long term flea control products.